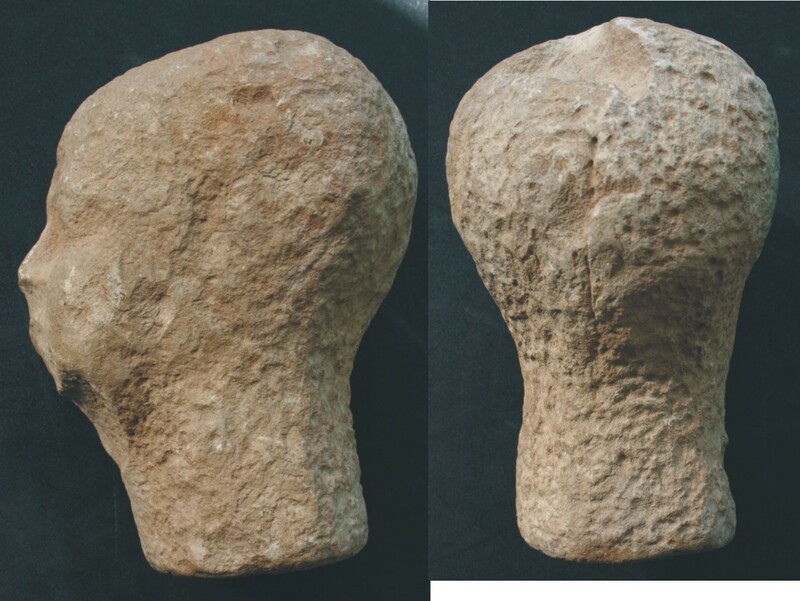 This stone object measures around 23cm in height. It has traces of blue paint though these are probably modern (other items in the collection have similar paint). It is not part of a sculpture as it is carefully smoothed off on the base. Such items are known by Egyptologists as ‘reserve heads’. About 30 reserve heads are known, and all come from private mastaba tombs around Memphis (usually Giza). Most date to the 4th Dynasty, though a few date to the 5th. With a few exceptions (Smith 1949, 25-27; Lacovara 1997, 31), they are not usually recorded as having been excavated from the burial chamber itself but were walled-up in the passage or at the bottom of the tomb shaft (Vandersleyen, 1977). However, it is possible that those not found excavated from the burial chamber had been thrown into the shaft by thieves and, as Reisner believed, they had been originally placed in the burial chamber. (D’Auria et al. 1988, 82). These heads are not parts of statues but rather represent complete objects in themselves. Cropped hair, or a close fitting skull cap, is a feature of these pieces. A number, like ours (see above, right), have a vertical groove down the back of the cranium. At least some reserve heads were painted. A black painted reserve head was found in a burial chamber (Eaton-Krauss 1976, 24) and a head of Kanofer had traces of black and yellow paint (Knudsen, 1987 quoted in D’Auria et al., 1988). Red paint was also found on a male reserve head now in the Museum of Fine Art in Boston, Massachusetts (D’Auria et al., 83). Their purpose is uncertain. It is possible that they were intended as an enduring substitute for the actual head of the deceased, or a means by which the dead could identify their own body. At this date mummification was not fully developed and so decay of the body might necessitate a ‘spare’ head. Many of the heads have damaged or unfinished ears and incisions cut into their surface around the neck, as well as, as stated above, down the back of the cranium. These features have been interpreted as ritual destruction, suggesting perhaps that the heads symbolised a decapitation and a means of protecting the living from any evil intentions on the part of the dead. Alternatively, the intention may have been to protect the dead. Interestingly, other structures associated with death and burial were often similarly dismembered. For example, the southern ships of Khufu, or the canopy found under Khafre’s satellite pyramid. This canopy had probably been used for transporting a funerary statue but was then chopped up and put in a blind passage under the pyramid. In the Pyramid Texts, hieroglyphs representing human beings are decapitated. Disassembled items, including bodies themselves, seem to be a feature of some, but not all, early burials, from Predynastic times until the end of the Old Kingdom. Often skeletal and mummified remains are found dismembered, although often reassembled (sometimes incorrectly) in a way representing a living form. Or pieces may be entirely missing. This is perhaps linked with the idea of dismemberment mentioned in the Pyramid Texts and later in the myth of Osiris, suggesting dismemberment is takes place before rebirth. Fragmentary burials are not uncommon even in the recent past and may be associated with secondary burial, or the taking of parts of bodies as mementoes for the living, or with ancestor rites. However it is perhaps dangerous to make too much of this theory in relation to reserve heads. The destruction of representations of the deceased is not known in other Egyptian tombs. 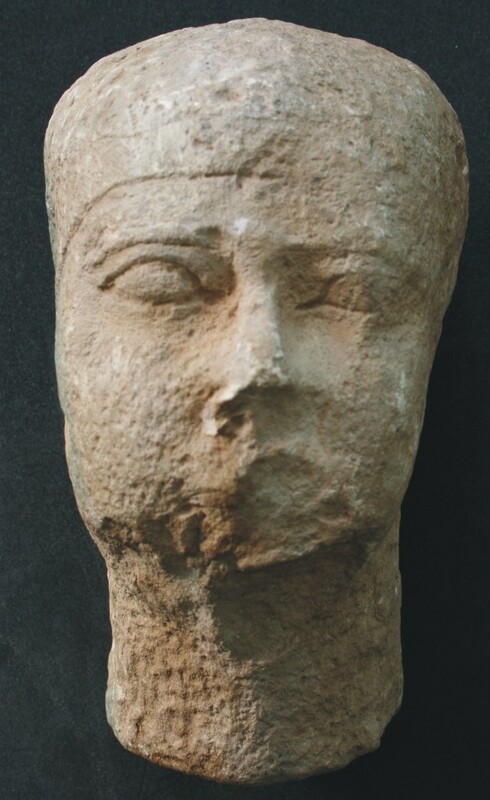 One hypothesis states that reserve heads were sculptor’s prototypes and that moulds were taken from them, perhaps at the tomb site for workers on relief portraits or in the sculptor’s workshop (Kelly 1974, 9). This might explain the scoring around the back of the skull. The sculptor would remove the mask, once it had dried, by cutting down the skull, leaving a groove. The ears would often break off in the process. Plaster has been found adhering to one reserved head (G4940 in Boston) which perhaps represents part of a mould (Millet 1981, 130; d’Auria et al., 1988, 83). However, it is difficult to see how a mask could be removed without damage. It could be removed in two halves, in which case one would expect the groove to run from ear to ear, which it does not. Reisner believed the cranial groove to be the result of thieves looking for gold in heads they believed to be hollow (D’Auria et al. 1888, 83). However, one would imagine that thieves would simply smash open such items. Lacovara (1997) convincingly suggests that the grooves are actually sculptor’s guidelines used in making the items, and points out that they are very similar to the hairline marks. In seemingly more finished examples the marks can hardly be seen or are not presents. The damaged noses and ears could well be the result of grave-robbers throwing the artefacts aside. The plaster found adhering to one reserve head may well be the result of the artist remodelling an incorrectly carved face. Lacovara also suggests that the heads were used in the same way as the wooden busts of the deceased placed in other tombs. A large stone sculpture would have been difficult to manoeuvre down a tomb shaft and so more portable heads were placed there. Whatever the purpose of the heads, they are for us a representation of the people of the royal courts of Old Kingdom Egypt, portraits of the elite. It seems unlikely that these stone artefacts represent the poor. Unfortunately we know little about the history of our head. It was purchased by Sir Henry Wellcome at a Sotheby auction on 12th-13th November 1928 (item 334). D’Auria, S., Lacovara, P. Roehrig, C.H., 1988, Mummies and Magic – The Funerary Arts of Ancient Egypt. Boston: Museum of Fine Arts. Eaton-Krauss, M.., 1984, The Representations of Statuary in Private Tombs of the Old Kingdom. Wiesbaden: Otto Harrassowitz. Knudsen, J., 1987, ‘A Question of Paint: An Investigation into Traces of Paint on the Reserve Head from the Tomb of Ka-nofer,’ paper presented at the Annual Meeting of the ARCE, April 24, 1987. Lacovara, P., 1997, ‘The Riddle of the Reserve Heads’, KMT 8 (4) 28–36. Millet, N.B., 1981, ‘The reserve heads of the Old Kingdom’, In W.K. Simpson and W.M. Davis, eds. Studies in Ancient Egypt, and the Sudan. Essays in honor of Dows Dunham on the Occasion of his 90th Birthday, June 1, 1980, Boston: Department of Egypt and the Ancient Near East, Museum of Fine Arts, 129–131. Naville, E., 1909, Les têtes de pierre déposées dans les tombeaux égyptiens. Avec une figure. Mémoire publié à l’occasion du Jubilé de l’Université. 1559 – 1909. Geneva: Libraire Georg. Picardo, N.S. 2007. ”’Semantic Homicide” and the So-called reserve heads: The Theme of Decapitation in Egyptian Funerary Relgion and some implications for the Old Kingdom’, Journal of the American Research Center in Egypt, 43, 221-252. Smith, W.S., 1949, A History Of Ancient Egyptian Sculpture and Painting In The Old Kingdom. London. Vandersleyen, C.L., 1977, ‘Ersatzkopf’, In W. Helk, E. Otto and W. Westendorf, eds. Lexikon der Ägyptologie II, Weisbaden: Otto Harrassowitz, 11–14.